Not to be confused with Promontory Point, Utah. 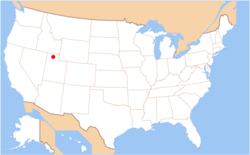 Promontory is an area of high ground in Box Elder County, Utah, 32 mi (51 km) west of Brigham City and 66 mi (106 km) northwest of Salt Lake City. Rising to an elevation of 4,902 feet (1,494 m) above sea level, it lies to the north of the Promontory Mountains and the Great Salt Lake. It is notable as the location of Promontory Summit, where the First Transcontinental Railroad in the United States was officially completed on May 10, 1869. Promontory Summit had been agreed upon as the point where the two railheads would officially meet, following meetings in Washington, D.C. in April 1869,  where it was also agreed that a ceremony would be held to drive in the Last Spike to commemorate the occasion. However, the original date of May 8 had to be postponed for two days because of bad weather and a labor dispute on the Union Pacific side. Promontory Summit marks the site where the First Transcontinental Railroad was officially completed, although a direct coast-to-coast rail journey on this route was not achieved until 1873. The Mossdale Bridge spanning the San Joaquin River near Lathrop, California was completed in September 1869, connecting Sacramento, California to the network. Passengers had to cross the Missouri River by boat between Council Bluffs, Iowa and Omaha, Nebraska until the Union Pacific Missouri River Bridge was built in 1873. In the meantime, the first uninterrupted coast-to-coast railroad was established in August 1870 at Strasburg, Colorado, with the completion of the Denver extension of the Kansas Pacific Railway. In the final decades of the 19th century, Promontory Station was used by large ranching firms, such as those of John W. Kerr, John L. Edwards, and Charles Crocker, to ship their cattle to the stockyards in San Francisco and Chicago. At the turn of the 20th century, wheat farmers had begun to change the landscape around Promontory with farms and families. Promontory had a one-room school, as well as a commercial store/post office; it had become the main crossroads stop for small farms. However, during the droughts of the 1930s, individual farmers moved away from Promontory, leading to the consolidation of their lands into large holdings. Although Union Pacific engineers had initially considered a direct route across the Great Salt Lake, cost and schedule constraints forced them to opt for the surveyed line through Promontory. As trains became longer and heavier, additional engines were often required to pull them along the winding curves and up steep grades to the Promontory summit. 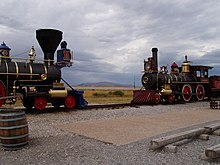 On the 110th anniversary of the "Golden Spike" on May 10, 1979, two purpose-built replicas of the UP #119 and the Jupiter #60 were brought together on a specially relaid 1.5-mile section of track. As the original Jupiter had been scrapped for iron in 1901 and No. 119 had been broken up two years later, the two replica locomotives were built in California with $1.5 million of federal funds. They were reconstructed using scaled-up measurements taken from photographs of the original engines  and reference to similar engines of the time. Wikimedia Commons has media related to Golden Spike National Historic Site. ^ "Pacific Railroad Act - Transcontinental Railroad and Land Grants". Retrieved 2008-12-25. ^ "Promontory". Geographic Names Information System. United States Geological Survey. Retrieved 2011-10-31. ^ a b c d "Ceremony at "Wedding of the Rails," May 10, 1869 at Promontory Point, Utah". World Digital Library. 1869-05-10. Retrieved 2013-07-20. ^ a b "Chinese-American Contribution to Transcontinental Railroad". Central Pacific Railroad Photographic History Museum. Retrieved 28 July 2013. ^ "Chinese Laborers and the Construction of the Central Pacific". Central Pacific Railroad Photographic History Museum. Retrieved 28 July 2013. ^ Brian Sullivan, " Day 98: Rev. John Todd," Berkshire Eagle, April 8, 2011. ^ John Todd, John Todd: The Story of his Life, (Harper & brothers, 1876), 403-404. ^ Bowman, J.N. "Driving the Last Spike at Promontory, 1869" California Historical Society Quarterly, Vol. XXXVI, No. 2, June 1957, pp. 96–106, and Vol. XXXVI, No. 3, September 1957, pp. 263–274. ^ Mildred Brooke Hoover, Douglas E. Kyle (2002). Historic spots in California. Stanford University Press. p. 378. ISBN 978-0-8047-4482-9. ^ a b c d e f g L. Spude, Robert & Todd Delyea (2005). Promontory Summit, May 10, 1869. National Park Service. pp. 41–49. ^ a b c "The Trestlewood Furniture Story". Daniel S. Dawdy and Ribbon Rail Productions. Retrieved July 31, 2013. ^ Hofsommer, Don L. (1986). The Southern Pacific, 1901-1985. Texas A & M University Press. p. 192. ^ "The Trestlewood Story". Trestlewood. Retrieved 2009-06-20. ^ "Everlasting Steam: The Story of Jupiter and No. 119" (PDF). National Park Service. Retrieved August 13, 2013. ^ "Outdoor Activities". National Park Service. Retrieved August 13, 2013. Wikimedia Commons has media related to Promontory, Utah. "Producer Q&A: A conversation with Ken Verdoia, producer of "Promontory"". KUED.com. Archived from the original on 2002-06-20. Pribonic, Mark A. " The Myth of the Great Railroad Meetup." Mises Daily, April 4, 2007.